Hotel Camiral is located at PGA Golf de Catalunya Girona and nearby the Dalí Museum (Figueres), Costa Brava beaches and stunning medieval villages. Hotel Camiral at PGA Catalunya Resort offers 149 rooms and suites, dining choices at Chimera Restaurant, Tast Brasserie & Pool Bar 36, free WiFi internet throughout the hotel, Internet corner (E-Point with charge), YHI Wellness, 24 hour full gym, 2 golf courses, a spectacular pool set in gardens, terraces, outdoor car park and indoor parking with charge. Listed Golf Package prices at Hotel Camiral include Premium Rooms, Daily Breakfast & Golf. Groups of 8 receive FREE Hotel & Golf for Group Leader on the same basis as the Group. Groups of 8 staying 4 Nights+ receive FREE Airport Transfers from Girona Airport. 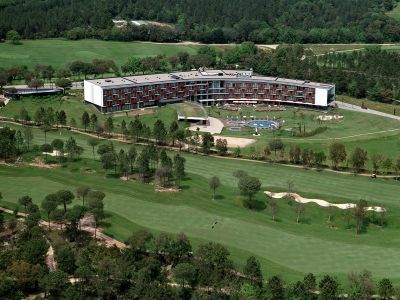 Hotel Camiral at PGA Catalunya Resort provides 149 contemporary rooms and suites, all outward-facing and with fabulous panoramic views of the golf course, pool, driving range or Zen garden. Equipped with two single beds, double queen or king-size, dressed with high quality fabrics, equipped with a flat screen TV, individually controlled air conditioning and heating, free WiFi Internet, minibar, safes for laptop, kettle for coffee or tea, a spacious bathroom with a separate shower and bathtub and a full set of bathroom amenities. Choose between different categories: Premium room, Grand Premium, Duplex, Duplex Deluxe, Junior Suite, Suite, Family Room and Family Room Kids & Co. PREMIUM ROOM (36m²) Views of the Zen garden or driving range. GRAND PREMIUM ROOM (35m²) Spacious, elegant and bright rooms with furnished terrace (6m²) and views of the pool or golf course. DUPLEX MELIA ROOM (50m²) Exclusive rooms with two floors. On the lower floor, there is a lounge, a dining room with sofa and TV, and a double bathroom. On the upper floor, the bedroom (with queen size bed) boasts spectacular views over the golf course. The rooms are equipped with a great range of services and facilities: golf art, intelligent lighting systems, DreaMax beds with quilts and wardrobes with internal lighting. The bathroom has a window with views of the lounge. DUPLEX GRAND PREMIUM ROOM (50m²) Exclusive rooms with two floors and a furnished terrace (6m²) with great views of the driving range. JUNIOR SUITE (60m²) With a great location at the corners of the hotel building and with furnished terraces (15-32m²), providing a charming bathroom with dressing room, desk with coffee and tea-making facilities, individual room temperature control, golf art, designer lamps, and a lounge with sofa for watching the TV in comfort. Decorated con wooden skirting boards and carpeted floors. The Hotel Camiral at PGA Catalunya Resort specialises in Mediterranean cuisine with a modern flair and a selection of the best fresh and local produce. A la carte restaurant specialising in Mediterranean cuisine with a modern flair. Choose from a wide variety of starters, pasta and rice dishes, fish, meat and delicious desserts. International and regional specialities. Set menu available including 1 aperitif, 2 starters, 2 main courses and 2 desserts of your choice. Extensive menu of hot and cold snacks with our innovative Vermouth Tast (tapenade, potato chips), Pica Tast (nachos with guacamole, mini spring rolls, cold cuts with "pa amb tomàquet" Spanish and international cheeseboard. 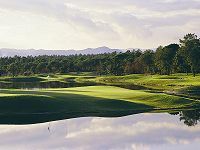 The internationally famous PGA Catalunya Resort golf courses allow you to enjoy the best golf experience in Spain. The two courses, the Stadium Course and Tour Course, are masterpieces of golf architecture, with fairways lined with lush forests, numerous water hazards and magnificent panoramic views. Hotel Camiral at PGA Catalunya Resort offers a complete YHI Wellness with 3 treatment and massage cabins, a pleasant hydrotherapy area and a fully equipped gym open 24 hour a day. Hotel Camiral at PGA Catalunya Resort offer the ideal location for you to balance work, relaxation, culture and leisure. • Culinary and wine tasting tours in Girona. Here is the world’s best restaurant: “El Celler de Can Roca”. • Girona, which is crossed by the rivers Ter, Güell, Galligants and Oñar, is 103 kilometres north east of Barcelona and only a 30 minute drive from the Costa Brava. • The Old Quarter of Girona (Barri Vell) is considered one of the most evocating in Cataluña, and has many unique monuments, including: the Call (old Jewish quarter); the famous, colourful houses along the river Oñar, and the cathedral. PGA Golf de Catalunya has been regularly ranked within the top 10 European venues by Golf World magazine. The Stadium course is suited to straight hitters with tight, tree-lined fairways, strategically placed bunkers and lakes on seven of the toughest holes keeping the golfers attention! The European Tour Spanish Open took place at the Stadium Course in 2009, and was won by former Ryder Cup star Thomas Levet. PGA Golf de Catalunya opened in 1999 and has quickly gained an international reputation. 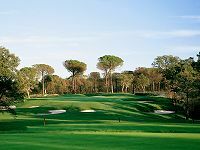 The Tour course is shorter and less difficult than the Stadium, with more open fairways but pine trees and lakes on five holes.